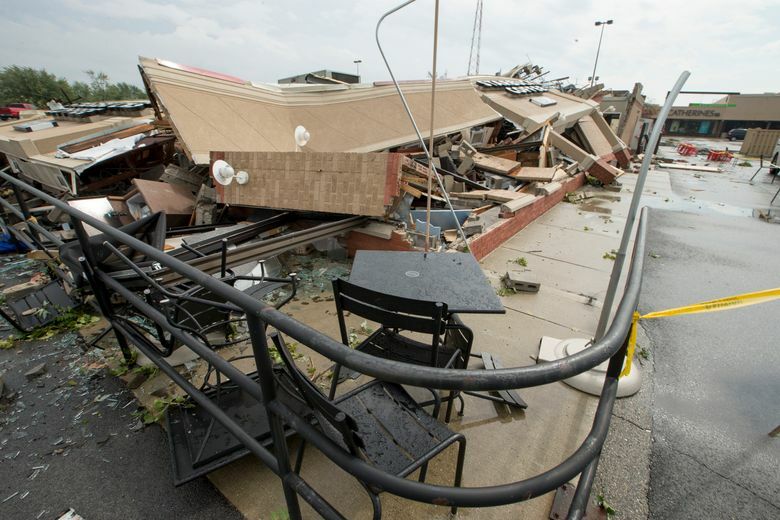 INDIANAPOLIS (AP) — No serious injuries were reported after multiple tornadoes touched down Wednesday in central Indiana, tearing the roofs off apartment buildings, sending air conditioners falling onto parked cars and cutting power to thousands of people. About a dozen people suffered minor injuries as the tornadoes moved through the area, said State Police spokesman Capt. David Bursten. Most of those injuries were in Howard County and included a resident who was trapped in a home by one of the storms. Bursten said those injured included a 5-month-old child who suffered a laceration in Montgomery County. He attributed the relatively small number of injuries reported by 8 p.m. to residents taking the approaching storms seriously. Kokomo Mayor Greg Goodnight said at a news conference Wednesday evening that there was “substantial damage to property — a lot of trees are down” in the city. Eight funnel clouds were spotted throughout the afternoon but it’s unclear how many touched down, according to Howard County authorities. National Weather Service meteorologist Brad Herold said a preliminary survey shows an EF3 tornado with maximum winds of 165 mph struck Kokomo, about 40 miles north of Indianapolis. He estimated 20 to 30 cars had been damaged by falling tree limbs and air conditioners. Utility companies reported more than 32,000 customers were without power statewide as of 9:15 p.m. 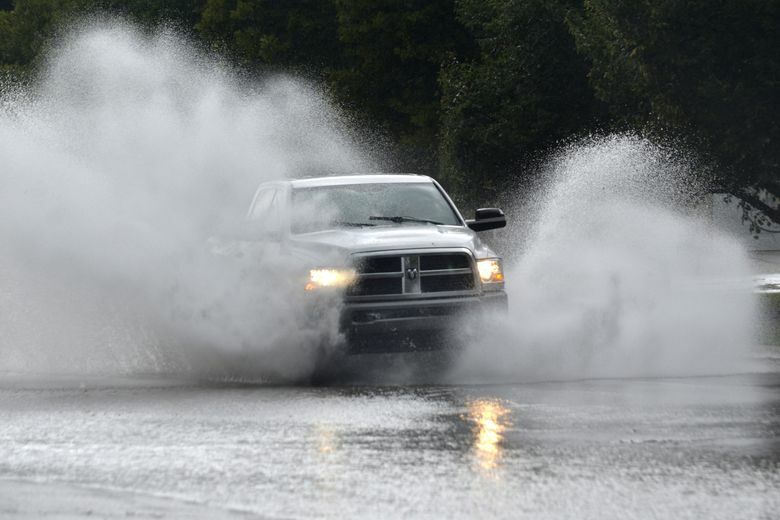 The city of Kokomo and Howard County declared a joint state of emergency closing all roads to people and motor vehicles, apart from emergency vehicles, until 10:30 p.m. Wednesday. Gov. Mike Pence said he would be touring storm-damaged Howard and Montgomery counties on Thursday to assess the damage. He said he would remain in the state “as long as we need” to make sure people affected by the storms have the necessary support. Pence returned to his home state Wednesday evening. The Republican vice presidential candidate was campaigning in North Carolina when the twisters touched down in Indiana. Upon his return, Pence visited the state’s emergency operations center in downtown Indianapolis. The governor also said he had a “grateful heart” that there were no reports of deaths or serious injuries. 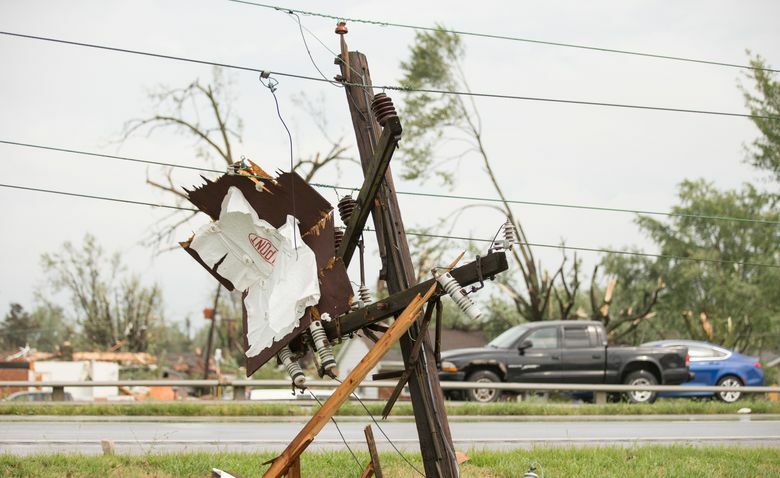 Howard County Commissioner Paul Wyman noted that the county and the city of Kokomo faced tornado damage in November 2013 when the region was hit by a twister that damaged homes and businesses and injured nearly three dozen people. “Kokomo and Howard County will bounce back once again, and once again we’ve got to reach in deep and do the work of recovery,” Wyman said. 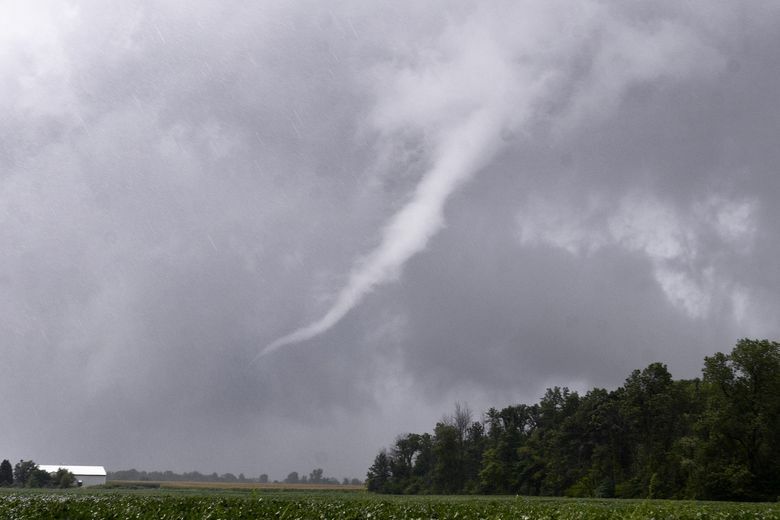 Police officers in Indianapolis also spotted at least two funnel clouds close to the ground Wednesday just south of Interstate 70, according to officer Jim Gillespie of the Indianapolis Metropolitan Police Department. 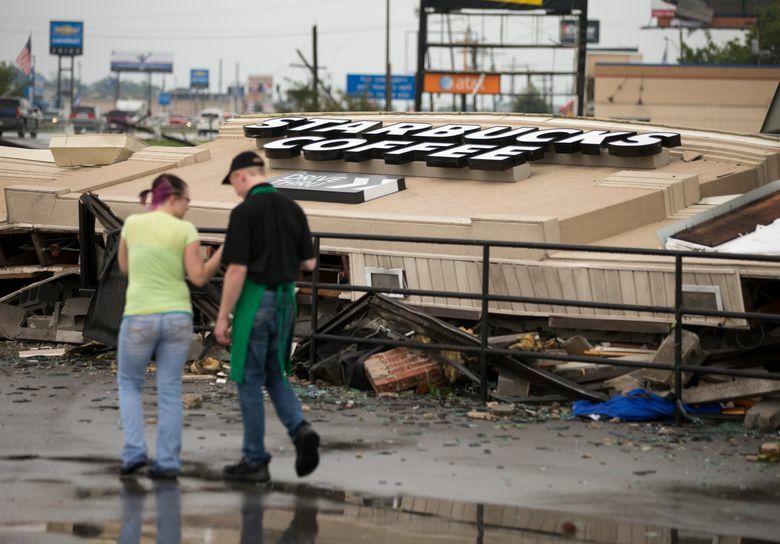 Television station WTHR showed images of a toppled Starbucks in Kokomo. 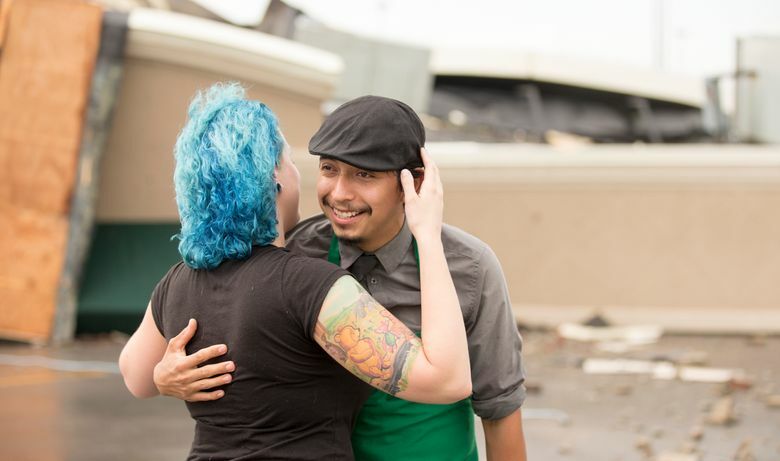 Starbucks released a statement on its website Wednesday evening, saying “all partners (employees) and customers” at the damaged coffee shop were safe. Indiana University Kokomo canceled all events on campus Wednesday evening due to the severe weather. School officials in Avon, near Indianapolis, cited the severe weather in ordering all buses to return to the nearest school. The buses were allowed to start moving again a short time later.